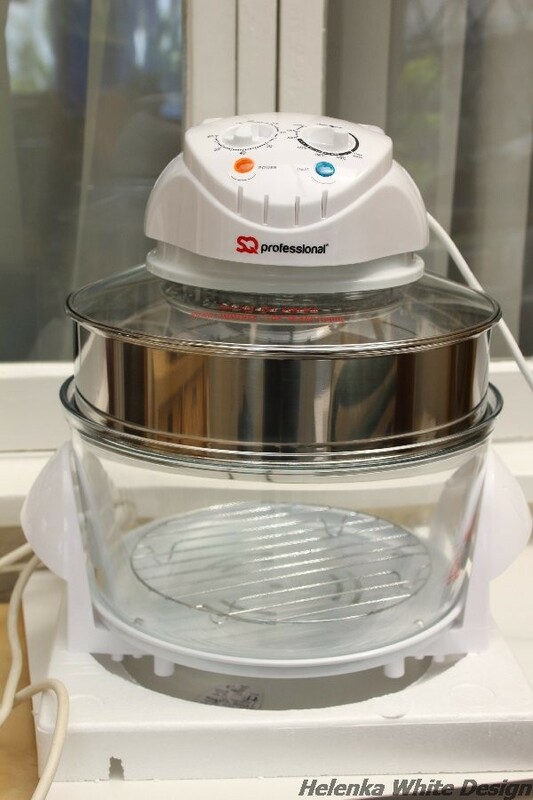 In today’s post I am writing about my new tool – the halogen oven. I use this oven to cure my polymer clay creations. I normally use my toaster oven for the job. The problem though is that the temperature of this oven fluctuates during baking and each brand of clay has their own curing temperature. Premo, Sculpey and Cernit cures at 130C, FIMO cures at 110C and Kato at 150C. If the temperature is exceeded the clay starts to burn and the smell is pretty toxic. I learnt the hard way twice and burnt my clay – despite having a kitchen thermometer in the oven (I now even use an additional digital thermometer which sits next to the oven). When I use my toaster oven, which is situated in the conservatory next to our kitchen, I tend to tidy the kitchen while keeping an eye on the temperature. This is a bit annoying because I can’t really do much else. I always find baking my clay nerve wracking, not only because of the risk of scorching the clay, but also because you never know how the items turn out. Another problem with using my toaster oven is – you can’t put tall sculptures in there. 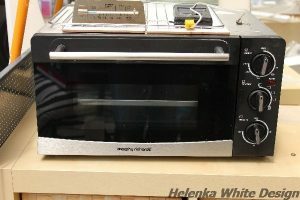 A few weeks ago I started a discussion about ovens in a polymer group on Facebook and someone recommended using a halogen oven because these types of ovens use a fan and distribute heat way more evenly than toaster ovens. I found a reasonably priced one on Ebay. I first tested it without the clay. The temperature range is 125C to 250C. So I can’t use it with FIMO. I was first really worried because it just crept up to 150C. So I tried it a few times on the lowest setting, just before the 125C mark. It stabilised between 130 and 140, which is fine, because you can go slightly over the recommended temperature. My oven is a 12 litre oven which can be extended to a 17 litre oven by using the metal ring that goes on top of the glass bowl. This is great because it allows me to cure taller items. And the glass bowl has the advantage that you can actually watch the progress and maybe take the item out if you notice something going wrong. So far I have only used it with my latest creation (soon to be listed in my shop). It’s a kangaroo sculpture, inspired by Kangaroo Dundee (Brolga Barns). I originally planned it as a female kangaroo with her joey sticking out of her pouch, but the head of the baby turned out to be too big and I used it as the main head instead. This was a rather challenging sculpture, because it’s tricky to balance it properly. I hope you like it. Thank you for reading. Please make sure to comment and share this post. 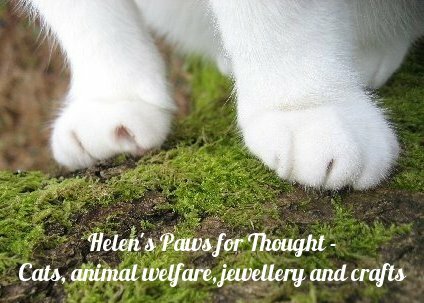 You can also sign up to my newsletter (see right hand side) to get my latest posts, offers and a 10% discount on your first purchase in the shop. Thanks for your comment. This one is a SQ professional – I think I paid about £28 for it. What a great idea – I’ve always just used my normal oven but using a halogen one sounds much easier. I wonder if my mum still has hers? 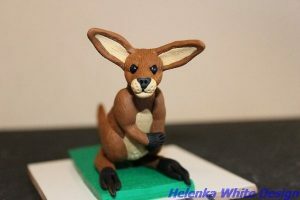 I’m new to polymer clay and am using Fimo clay. I had the same trouble as you when trying out a mini oven for the first time. At it’s lowest setting of 100 deg C my oven thermometer was reading 150 deg C and burned my experimental pieces. Then I remembered that I had a halogen oven in the attic, just like the one in your picture. I was disappointed when I saw the lowest temp on the dial was 125 deg C; however, you can set the dial anywhere between the zero mark and the 125 mark and it will maintain a temp between 0 and 125 deg C. Bit of tweaking of the temp dial and I found 110 deg C … perfect Fimo clay baking!! Will leave the dial set there. Mine is a JML; been in the attic for years!! Can I ask, if using a halogen oven, do you need to put your piece on anything? I was told to use a tile and foil around my Fimo creations but I am too scared to start, so any advice would be wonderful! my sculptures with aluminium foil but that doesn’t always work well as it gets blown off during baking and they are not easy to cover. The most important thing to do is actually to get a reliable kitchen thermometer you can place in the oven to make sure the temperature stays the same and doesn’t go over the stated temperature. I bought mine from Amazon from a Kitchen supplier (my second one as I managed to drop one and it broke (glass). So when I bake something I always check the temperature. And as I can’t completely cover it I can watch it while it bakes – that is useful as I have rescued things when I saw they were not curing the way I wanted them to cure! Good luck with your makes.